Sternbergia Lutea (Autumn Daffodil) bulbs are one of the best autumn flowering bulbs for a sunny position. With its bright, almost luminous deep yellow flowers and green foliage this is a real star in early autumn. Originally from the Mediterranean area through to Asia, this is a bulb that has been grown in Australia for many years and that thrives in our conditions. Sternbergia grow well in a sunny position and are ideal for the rock garden. Sternbergia Lutea or Autumn Daffodil also do well in pots. Full sun is best and top dress with a well rotted compost when dormant. These bulbs are usually frost tolerant. A soil that is well drained, particularly over the summer period is essential, and watering over summer should be avoided except in exceptionally long dry periods. 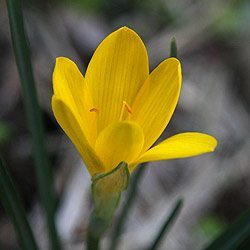 Sternbergia Lutea(pictured) or Autumn Daffodil will form a largish clump over time, and for best flowering the bulbs need to be divided every 5-6 years to promote healthy growth. Soil – Well drained with some moisture, sandy loam to light clay, dry in summer. Crocus including goulimyi, kotschyanus, medius, pulchellus, sativus (saffron crocus) ochroleucus, and speciosus.